Riverside Raceway (9/16/00) - This was the last night of racing for the year for all three of us. Fritz finished 2nd in both the Street Stock heat and features. Marlys had a battery go dead in the heat, where she finished 7th. She won the semi-feature, and worked her way up to 3rd in the Pure Stock feature. Tate finished 3rd in the Street Stock heat race, but slipped early in the feature and fell to the back (4th). Cedar Lake Speedway (9/13/00) - Fritz traveled to the Cedar Lake WISSOTA 100. He finished 5th in his heat. Unfortunately, he was involved in an accident in the semi-feature, which put him out of the race. Fritz is doing well in the national points, working his way up to 43rd in the WISSOTA Street Stock national points this week. TNT Speedway (9/9/00) - Fritz finished 4th in his heat and 6th in the Street Stock feature. Many of the Wissota Street Stock "big guns" were at the track, making for a very competitive field. Tate drove in the Pure Stock class. He picked up his first win of year at TNT by winning his heat. He worked his way up from 10th starting place in the feature to finish second. TNT Speedway (9/8/00) - Fritz had a short night when his car was hit on the axle in the heat race, putting him out for the night. Unfortunately, the night was even shorter for Marlys. Her starter overheated from a bent exhaust pipe before the races started, so she didn't get any racing in. Riverside Raceway (9/3/00) - Fritz wins his third Street Stock Championship this year! He claimed his 12th career championship at Riverside Raceway, and his 4th championship at that track. He finished off the year strong by winning the feature, and finishing 2nd in the heat race. Marlys had a tire punctured in the heat race, and had to pull off for a 5th place finish. She finished 4th in the semi-feature. Marlys finished 5th in overall Pure Stock points for the year. Tate also had a tire punctured early in his heat race, and ended up in 4th. He finished 3rd in the feature. He finished 2nd in Street Stock points for the year. Langlade County Speedway (9/2/00) - Fritz wins the Street Stock Championship in his first year driving at Langlade County Speedway! In the last race of the year Fritz finished 3rd in his heat, and 2nd in the feature. Riverside Raceway (8/29/00) - Fritz went for broke in the last corner of the last lap of the feature to get the win. The gamble didn't pay off, and he ended up finishing 6th. He won his Street Stock heat race. Marlys got a tire punctured in the Pure Stock heat race, which put her in the back of the semi-feature. She finished 4th in the semi, but only the top 3 made the feature. Tate finished 2nd in the Street Stock heat and feature. TNT Speedway (8/26/00) - Fritz wins the TNT Street Stock Championship! He has now won the Street Stock championship at TNT two years in a row, and is the 10th championship in his racing career. A motor swap earlier in the day didn't slow down Fritz. He went on to get another clean sweep, winning the Street Stock heat and feature. Marlys was back racing again after her motor blew two weeks ago. She did a great job too, winning her heat and finishing 2nd in the Bomber feature. Marlys finished 5th in the points for the year. Langlade County Speedway (8/25/00) - Fritz was on a roll, winning the Street Stock heat and the feature races. Unfortunately, the motor barely survived the night. Riverside Raceway (8/22/00) - Fritz had a very good night, finishing 2nd in his heat race, and winning the Street Stock feature. Tate finished 3rd in his heat race, and 2nd in the Street Stock feature. TNT Speedway (8/19/00) - It was another great night for Fritz. He repeated his Antigo performance from the night before, finishing 2nd in the heat and winning the Street Stock feature. Langlade County Speedway (8/18/00) - Fritz bounced back well from last week, finishing 2nd in the heat and winning the feature. Riverside Raceway (8/15/00) - A rock went through the oil filter on Fritz in the Street Stock heat race, causing him to pull out (5th place). He came back to win the feature though. Marlys had worse luck. Her motor tightened up before the races even started, so she was unable to race at all. Tate finished 4th in the Street Stock heat and feature. TNT Speedway (8/12/00) - It was a perfect night for Fritz. He made a clean sweep, winning the Street Stock heat and feature. Marlys wasn't so lucky. She blew her motor when she was running 2nd in the Pure Stock feature. Langlade County Speedway (8/11/00) - Fritz finished 5th in his heat race, and only 10th in the feature due to a flat tire. Fortunately, he still leads the Street Stock points. Riverside Raceway (8/8/00) - Rainout. TNT Speedway (8/5/00) - Fritz had a great night, ending his heat in 2nd, and winning his first feature at TNT. He also took over the Street Stock point lead. He now leads the points at all three tracks he races (TNT, Langlade Co., and Riverside). Marlys finished 4th in her heat and 3rd in the Pure Stock feature. Langlade County Speedway (8/4/00) - Fritz won his heat race, and finished 3rd in the Street Stock feature. He now leads the Street Stock points at Langlade County Speedway. Riverside Raceway (8/1/00) - Fritz won the Street Stock feature for the second week in a row. He finished 3rd in his heat. Marlys ended her heat in 3rd, and finished a close 2nd place in the Pure Stock feature. Tate won his Street Stock heat race, but finished last (10th) in the feature due to a wreck. TNT Speedway (7/29/00) - Fritz had a great night, winning his heat and scoring a 2nd place finish in the Street Stock feature. Marlys finished 3rd in her heat and 5th in the Pure Stock feature. Langlade County Speedway (7/28/00) - Rainout. Riverside Raceway (7/25/00) - The Street Stock count was up to 9 cars, which was better than previous weeks. Fritz won the feature after the winner was disqualified for running illegal tires. He also ended the heat race in fourth. Marlys had a great run by winning her heat, and racing to 3rd in the Pure Stock feature. Tate finished his Street Stock heat race in 2nd, and was 3rd in the feature. TNT Speedway (7/22/00) - Fritz won his heat, and finished 4th in the Street Stock feature. Marlys finished 4th in her heat race and finished second in the feature. Langlade County Speedway (7/21/00) - Fritz had a great night, ending up 2nd in the heat and winning the Street Stock feature. Riverside Raceway (7/18/00) - Fritz finished 2nd in both the Street Stock heat and feature. Marlys finished 3rd in the Pure Stock heat and 5th in the feature. Tate finished 3rd in the Street Stock heat and 3rd in the feature. Langlade County Speedway (7/14/00) - Fritz finished 4th in the heat and 3rd in the feature. He remains 2nd in Street Stock points. Riverside Raceway (7/11/00) - Fritz got another clean sweep in the Street Stocks this week. Marlys had a very good night finishing 2nd in the Pure Stock heat and 3rd in the feature. Tate finished 4th in the Street Stock heat and 3rd in the feature. TNT Speedway (7/9/00) - Nineteen Street Stocks showed up at TNT, a record for the year. Fritz finished 3rd in the Street Stock heat and 5th in the feature. Marlys won her heat race for the second week in a row at TNT, and finished 4th in the feature after starting 9th. Tate finished 4th in his heat and 13th in the Street Stock feature after the motor died with a couple laps to go. TNT Speedway (7/8/00) - Rainout. Langlade County Speedway (7/7/00) - Rainout. Riverside Raceway (7/4/00) - Fritz won the Street Stock heat, and finished 4th in the feature after pulling off with a flat tire. Marlys had a very good night finishing 2nd in the Pure Stock heat and feature. Tate finished 3rd in the Street Stock heat, getting a flat tire with a lap to go. Tate finished the Street Stock feature in second. TNT Speedway (7/2/00) - Rainout. TNT Speedway (7/1/00) - With lightning and heavy rain only a few miles from the track for most of the night, TNT Speedway squeezed in a full night of racing. Fritz finished 2nd in the Street Stock heat and feature. Marlys won her heat race, but only finished 14th in the feature because of a flat tire. Tate finished 4th in his heat and 5th in the Street Stock feature. Langlade County Speedway (6/30/00) - Fritz has a perfect night by winning the Street Stock heat and feature races. He is currently 2nd in Street Stock points at Langlade County Speedway. Riverside Raceway (6/27/00) - Fritz ended the heat race in 5th, and the Street Stock feature in second. Marlys completed her heat in 4th, which meant running the consolation race. She won the consolation race, her second win of the year, and finished 5th in the feature. Tate won his 3rd heat race of the year at Riverside Raceway, but only finished 5th in the feature due to a flat tire. TNT Speedway (6/24/00) - Once again TNT Speedway dodged a bullet on threatening weather, getting most of the races in before fog moved in. Overall it was a very good night of racing for the Scharf family. Fritz won his heat and finished 3rd in the Street Stock feature. Marlys had her best night of the year. She won her heat race, which was her first win of the year. She also had her best feature of the year, finishing second. Tate had his best night at TNT Speedway, ending up 3rd in his heat and 2nd in the Street Stock feature. Langlade County Speedway (6/23/00) - Rainout. Riverside Raceway (6/20/00) - Rainout. TNT Speedway (6/17/00) - Fritz had a good night finishing 3rd in the Street Stock heat. He finished 2nd in the feature after starting near the back, despite the fact the car took quite a beating in the feature. Marlys finished 2nd in her heat, and 3rd in the Bomber feature. She had the feature won until the steering wheel came off in her hands in the last corner of the last lap. Tate had a rough night finishing 5th in the heat, and 11th in the feature. An a-arm came loose near the start of the feature ending his night early. Langlade County Speedway (6/16/00) - Fritz finished 5th in the heat and the feature. Riverside Raceway (6/13/00) - The rain held off long enough to get in a full night of racing. Fritz had another great week in Street Stock by winning his second feature in a row at Riverside Raceway, and finishing a close second to Tate in the heat. Marlys finished 4th in her heat, 2nd in the semi-feature, and 7th in the Bomber feature. Tate won his 2nd race of the year by winning the Street Stock heat, and had his best feature of the year by finishing second. TNT Speedway (6/10/00) - Fritz had engine trouble in his Street Stock heat and pulled off early. The car was fixed for the feature, with Fritz finishing in 7th place. Marlys finished 2nd in her heat. She ran two features. One feature carried over from the rain-out last week. She finished 4th in the first feature and 8th in the second. Tate finished near the back of his heat, but went on to finish 4th in the Street Stock feature after starting 12th. Riverside Raceway (6/6/00) - Fritz and Marlys were both at Riverside Raceway on Tuesday night. Fritz drove to his best night of the year by getting a clean sweep, winning the Street Stock heat race and feature. In 2000 he has won 6 races in 7 nights. Marlys finished 2nd in the consolation race, and worked her way up to 5th in the Bomber feature. TNT Speedway (6/3/00) - Fritz had a great night by winning his heat and finishing second in the feature. Marlys finished 3rd in her heat. The Bomber feature was rained out. Tate broke an axle while leading his heat race and was out for the rest of the night. Langlade County Speedway (6/2/00) - Fritz has his best run of the year by winning his heat and finishing second in the feature. Riverside Raceway (5/28/00) - Riverside Raceway ran it's opener this past Sunday. Fritz finished 2nd in the heat and 4th in the Street Stock feature. Marlys finished 2nd in her heat and 6th in a full Bomber feature. Tate won his first race of the year by winning the Street Stock heat, and finished 5th in the feature. TNT Speedway (5/27/00) - Rainout. Langlade County Speedway (5/26/00) - Fritz repeats his performance of last week by winning his heat and finishing 3rd in the feature. TNT Speedway (5/20/00) - Fritz, Marlys and Tate were all competing in the TNT Speedway opener in Three Lakes on 5/20. Fritz finished 2nd in the heat and 2nd in the feature. Marlys was caught up in an accident in the heat race and unfortunately could not finish the heat or start the feature because of a broken power brake booster. Tate finished 5th in the heat and 5th in the feature..
Langlade County Speedway (5/19/00) - The Langlade County Speedway opener on 5/19 is the first race night of the year for Fritz. Fritz gets the first win of the season in the Scharf family by winning his Street Stock heat race. He finished 3rd in the feature. (5/4/00) - The newest Monte is coming together quickly. Fritz (Dad) will be racing this one when the season starts at TNT and Riverside later this month. 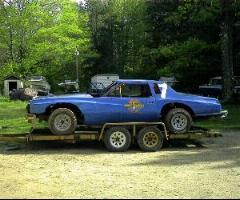 Fritz and Tate will be racing in the Street Stock division, while Marlys will be racing in the Pure Stocks. (4/27/00) - The racing season in northern Wisconsin is fast approaching so it's time to rebuild the website along with a few stock cars. This website originally had my (somewhat sparse) racing accomplishments from 1999, along with some historical information. This year Marlys and Fritz Scharf, otherwise known to me as Mom and Dad, will also have their info posted here. Hopefully that will happen within the next couple weeks. This site isn't very pretty now, and I'm not the type of guy who gets around to painting his stock car in the off-season, but hopefully I'll find some time in the near future to liven this site up a bit. 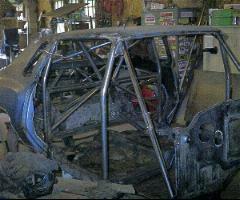 New Monte Carlo Street Stock under construction. Click here for more pictures from the 2000 racing season. Click here for final point standings from the 2000 racing season.